What Can You Learn from StoryChief’s Onboarding? Although an early stage SaaS, StoryChief really impressed me with their User Onboarding. I went ahead and asked them about their experience & learning. I recently interviewed folks at StoryChief. We recently teared down the user onboarding of 5 SaaS companies and Storychief was one of them. 1 – What is StoryChief? What problems are you solving? StoryChief is all about making content marketing easier and accessible for everyone…from creating and collaborating to publishing and measuring. Businesses of all sizes should be able to save time and production costs while publishing high quality content. We’re hoping this diminishes the “epidemic” of clickbait and “cheap” content marketing that seems to be running rampant. 2 – How did you come up with the perfect user onboarding idea? What did you exactly do? First, we observed what our users did and didn’t do. We also reached out to a number of our users for direct feedback. Only then could we determine our blindspots. We then created our own set of explanatory videos, and they made a big difference. But we also wanted a way to better guide our users to the right places, the “right place” being wherever it was they need to go to inside our app to make their StoryChief experience better. But we didn’t want to pull our development team off their existing projects. Plus, we knew that there would be further tweaks needed. So we decided to look for a solution. 3 – How did you implement that idea? 4 – What are you favorite onboarding app that you took inspiration from? We didn’t look at many but we’re keeping track of the metrics now so we can adapt where needed. We’d love to take a closer look into Userpilot. 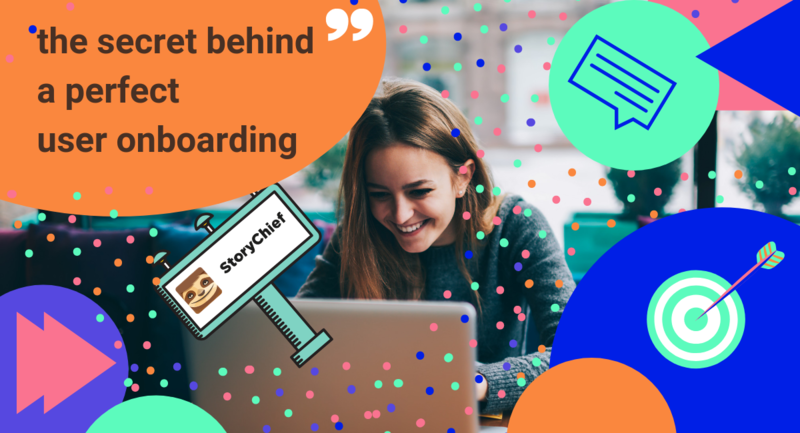 5 – Did you take any course/learning to make StoryChief onboarding great? Anything that you can recommend the readers. We didn’t, actually. We based everything on our own experiences and the feedback of our community of content creators. 6 – I saw you did apply some psychology in your user onboarding – What kind of other psychological tricks that we can use for user onboarding? If we tell you everything, we’ll have to kill you. Just kidding. In all seriousness though, most of us don’t walk around calling ourselves “gurus” in anything. So keeping the onboarding process somewhat light and sprinkled with positive reinforcement and humor is key. Nothing should feel mandatory or obligatory. 7 – What metrics do you follow and how do you measure it? Monitoring the point at which people people exit a guide before it ends has been very effective for us. 8 – How to build trust in those first few interactions? Well, with all new SaaS products, the brand recognition isn’t there yet so it’s a bit hard to build that trust right away. How many times have you had to check that box, “I’m not a robot,” when you do things online? Similarly, it’s important not to be just another tech robot when you’re on boarding users. Try to show your brand’s human side and be RELIABLE. Then you can start building up that trust. 9 – How to reduce a drop off rate after sign up? Send the right drip campaigns. Not too little and not too much. Always be helpful and remain true to your brand’s voice. 10 – How do you segment the users to give a great onboarding? We segment our users by the role they’re playing in the content creation process. In this way we can avoid clogging people’s inboxes with emails and unnecessary info demos. 11 – What’s the secret sauce behind a perfect user onboarding and retention? Keep it short and rewarding and never forget there’s a human being on the other side. My key learning from StoryChief is that consider that there’s a human who is using your app and make your user onboarding for that person.